Huge congratulations to the winners of our 5th grade reading contest, Anna Claire Powers and Carolyn Young. The contest is sponsored by the Nacogdoches Fire Department. 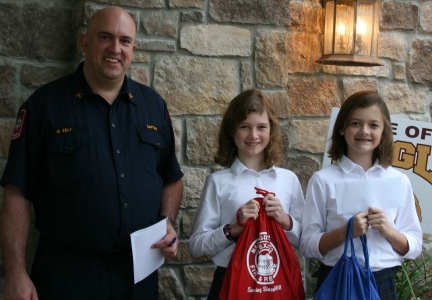 The first and second place winners received gift bags. Also, the first place winner rides to school in a fire truck and eats breakfast with the firemen. Anna Claire just barely edged out Carolyn to win the contest by reading the most during the month of February. Pictured are the girls with Captain Michael Self. 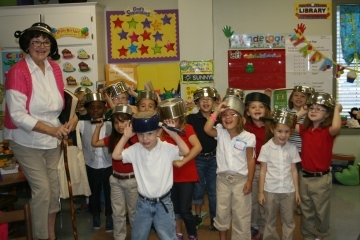 The Nacogdoches Fire Department sponsored a county-wide reading program for 5th graders during March and April, and Miss Hoffmann’s class enthusiastically participated. The second place winner, who read more than 7,000 pages, was Sydney Bryant. Sydney received a gift bag and congratulation from Captain Michael Self. (Drum roll, please…) The first place winner, who read more than 8,000 pages, was Ethan Fairley. Ethan also received a gift bag, but he also was given a ride to school on a fire truck while eating breakfast, courtesy of the Nacogdoches Fire Department. Great job, students! More than 15,000 pages in March and April alone — and that was just two students! Pictured below is Captain Self and also several of our brave firemen. 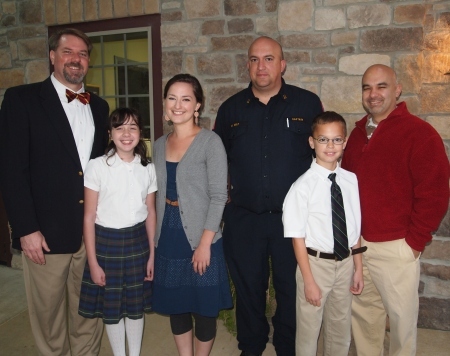 Also pictured is Miss Hoffmann and Ethan ‘s dad, Kerr Fairley. 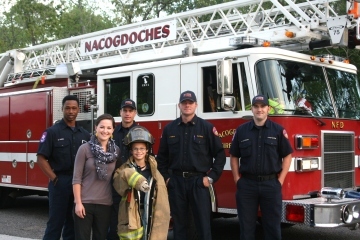 Thank you, Nacogodoches Fire Department! 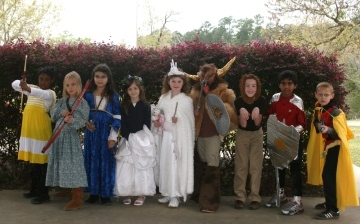 Mrs. Tyre’s third grade class celebrated reading The Lion, the Witch, and the Wardrobe by dressing in Narnia costumes and watching the movie version of the classic together. I think C.S. Lewis would be proud. 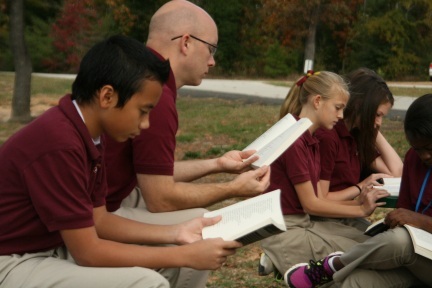 The Regents 6th graders read Louisa May Alcott’s classic Little Women each year. 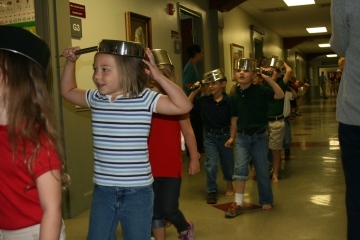 The class then celebrates the book with a Camp Laurence day, dressing in period attire and enjoying a delicious meal. 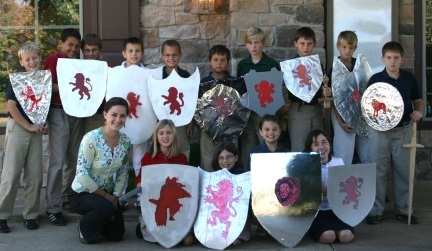 Pictured below is the 6th grade class in their costumes with their teacher, Kara Bertke. 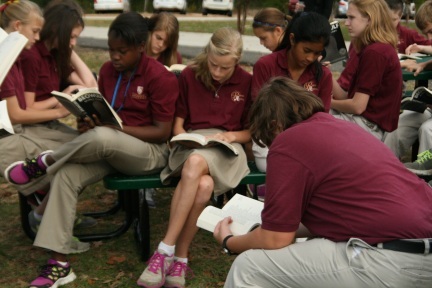 On a mild and sunny day, Mr. Vermillion’s 7th and 8th grade Omnibus class recently went outside to read. 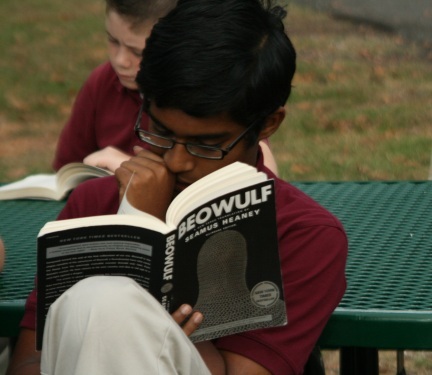 The class is immersing themselves in Anglo-Saxon culture and literature through their reading of the epic Beowulf, the classic tale of adventure in which the warrior Beowulf conquers the horrible monster Grendel. 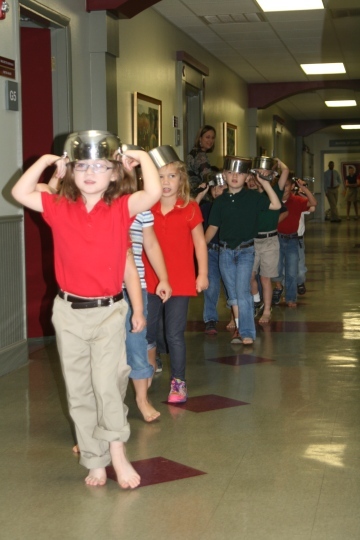 Even young students can read and enjoy the Great Books when they are led by a skilled teacher, given the tools of learning, and expected to reach a higher standard. They also get to go outside and sit in the sunshine! Miss Hoffmann’s 5th grade class just finished reading The Silver Chair by C.S. Lewis, and as a celebration each made shields with the image of Aslan on them. Great work, 5th grade! 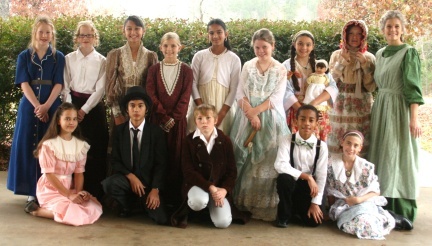 It was costume day in the 5th grade! 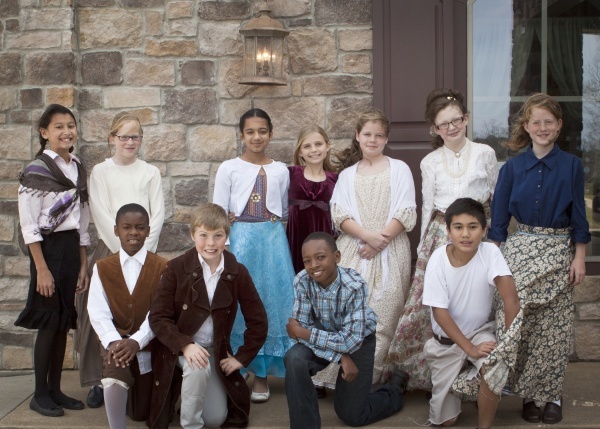 After finishing reading Johnny Tremain, a historical novel set during the Revolutionary War, the fifth grade, led by their teacher Ruth Hoffmann, dressed up as characters from the story and did research projects on famous men from that era. Each afternoon I join the Regents juniors and seniors in Omnibus class and read great literature with them. It would be hard work if it weren’t so much fun. The last few weeks we have been reading Walden by Henry David Thoreau. One of the most read and well-loved books in the American canon, Walden is Thoreau’s meditations on his two-year experiment in living alone at Walden Pond near Concord, Massachusetts, where he endeavored to find a simpler life so that he might better know himself and his environment. The book reads sometimes like a diary, sometimes like a naturalist’s journal, sometimes like a collection of essays, and sometimes like a prophet’s screed. Some of Thoreau’s most trenchant comments concern the reading of books. The classically trained Thoreau was a devoted bibliophile who kept a copy of Homer’s Iliad open on his table in his cabin at Walden Pond. Thoreau states it far more eloquently than I can: it is through reading great books, the books “we have to stand on tip-toe to read,” that we come into contact with the great and transforming truths that have shaped our culture for generations. This is the guiding principle behind the Omnibus curriculum. When students behold what is true and good and beautiful in the printed word, they find their souls being nourished and their minds being challenged. They find wisdom and eloquence being formed in them. They often find “a new era in their lives” being birthed. The hard truth is that we are naturally shallow, lazy, and self-centered. Only God’s grace can shake us from our superficiality, lethargy, and egotism. One way God does so is through teachers who expose our minds to the beauty and power of the printed word, especially in the books of the Great Tradition, and the ideas they contain. At Regents Academy we teach great literature, “the noblest recorded thoughts of man.” We do so unashamedly, and we aspire to do so with excellence. We hope to do nothing less than change students lives. With God’s help and with inspiration from thinkers like Thoreau, we will do so for years to come.